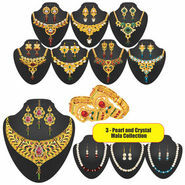 The Shagun 1 Gram Gold Plated Jewellery Collection by Variation includes in 36 Items. These jewels deliver aesthetic appeal and are exquisitely crafted ones with ethnic designs that add glamour to your style. The lustrous appeal makes it incredible at looks and colourful beads enhance the elegance when teamed with a matching outfit. The whole collection is great for wedding as well as parties, festivals etc. Both necklace & earrings are beautifully studded with colourful CZ diamonds & beads. Non Allergic and Non Reactive artificial gold plated jewellery. The effects may vary from person to person. The vendor assumes all responsibility for this product, which includes the warranty, brand, creative, trademark & copyright. Free - 3 Pearl and Crystal Mala Collection + 6 Earrings - 9 Pcs.